Little Ongava is perched atop a rise in the 30,000 hectare Ongava Game Reservewhich borders the Etosha National Park to the north. Commanding magnificent vistas of the African savannah, Little Ongava is arguably Namibia’s most exclusive and luxurious safari destination. Its proximity to the Etosha National Park makes it ideal for exploring Namibia’s premier wildlife reserve. Little Ongava is quite possibly Namibia’s most luxurious and exclusive safari destination. Perched atop a rise overlooking a nearby waterhole, Little Ongava is known for its panoramic vistas of the surrounding African savannah. With only 3 spacious, luxurious and private units, Little Ongava really does offer an intimate and exclusive experience for its guests. Each unit features its own plunge pool, a sala, and an en-suite bathroom with both indoor & outdoor showers and a bath with a magnificent view. The dining and lounge areas share the same wonderful views of the waterhole below and lend themselves to relaxed, stylish meals under thatch or African sky alike. 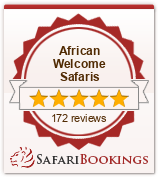 The Ongava Game Reserve is situated on the southern boundary of the Etosha National Park. It is unfenced, enabling large game such as elephant and lion to move freely between the Park and the Reserve. Activities at Little Ongava revolve around day and night wildlife-viewing drives, visiting hides that overlook waterholes and walks with experienced guides. A hide at the camp waterhole provides superb photographic opportunities. The Ongava Game Reserve features all the characteristic wildlife of the area, with both desert-adapted black and white rhino to be seen as well as lion. Game drives and daytrips into the easily accessible Okaukuejo area of Etosha National Park are rewarding, with sightings of lion, elephant, gemsbok, springbok, red hartebeest, and white and black rhino. Guests at Little Ongava share a dedicated guide and Land Rover, ensuring the best possible nature experience at one of Africa’s great wildlife destinations.